Three of NXT’s brightest Superstars will battle for the opportunity to challenge for the NXT Championship at TakeOver: Unstoppable, as Finn Bálor, Hideo Itami and Tyler Breeze will meet in a No. 1 Contender’s Triple Threat Match. Each Superstar is more than worthy of a title match, but they’ll have to prove it inside the ring during the live broadcast on WWE Network. Bálor emerged victorious from an eight-Superstar tournament earlier this year to win the No. 1 Contendership, defeating Curtis Axel and Itami en route to a showdown with Neville in the finals at TakeOver: Rival. Donning his demonic war paint, Bálor defeated the high-flyer with the Coup de Grace to earn a title match. The Irish Superstar came up short against NXT Champion Kevin Owens, but is eager for another crack at the title. At last May’s TakeOver, Breeze defeated Sami Zayn to become the No. 1 Contender to the NXT Championship. Prince Pretty’s only one-on-one title match came in August 2014, when he challenged Adrian Neville, only for Sami Zayn and Tyson Kidd to interfere, setting the stage for the Fatal 4-Way scramble that WWE.com placed among the best of the year. Since then, Breeze has been immersed in a rivalry with Itami, defeating the Japanese sensation in a grueling 2-Out-of-3 Falls Match. He recently set his sights on Bálor, making this Triple Threat Match a bit undesirable for Prince Pretty. Itami may be the wild card in the equation. Since arriving in NXT, he has made his presence felt in high-profile bouts against The Ascension and Breeze, in addition to appearing on The Grandest Stage of Them All, WrestleMania. However, the Japanese star has yet to challenge for a title in NXT. Hideo Itami is on quite a roll as of late. Could this be his golden opportunity? Who will become the No. 1 Contender to the NXT Championship? Find out at NXT TakeOver: Unstoppable, live on the award-winning WWE Network on Wednesday, May 20, at 8 ET/5 PT! At NXT TakeOver: Rival, the next Superstar to challenge for the NXT Title will be determined when Adrian Neville and Finn Bálor go toe-to-toe in the NXT Championship No. 1 Contender’s Tournament Final. For weeks, the NXT Universe has watched excitedly as a field of eight Superstars has been winnowed down to just Neville and Bálor. The Man Who Gravity Forgot, who held the NXT Title for nearly 10 months before falling to current champion Sami Zayn, advanced to the final round by defeating Tyson Kidd and then Baron Corbin. Irish-born sensation Bálor, meanwhile, stomped his way into the finals with wins over Curtis Axel and respected ally Hideo Itami. At TakeOver: Rival, the two dynamic and highly popular Superstars will meet for the first time in an NXT ring. What can the world expect to see when Neville’s blink-and-you-missed strike combinations and aerial artistry are pitted against Bálor’s world-renowned arsenal? Will Neville leap back into the NXT Title scene just months after losing the championship? Or will Bálor, who has taken away the collective breath of the NXT Universe since debuting in September, force his way into title contention for the first time? Watch the highly anticipated tournament final when NXT TakeOver: Rival airs live on Wednesday, Feb. 11, on WWE Network, which is available for free to new subscribers for February! At WWE NXT TakeOver: R Evolution, two of NXT’s brightest new Superstars, Hideo Itami & Finn Bálor, will join forces to battle the most dominant tag team in NXT history, The Ascension. This simmering rivalry took root at NXT TakeOver: Fatal 4-Way in September when Konnor & Viktor, incensed over losing the NXT Tag Team Titles earlier that night, spoiled Itami’s introduction to the WWE Universe by ambushing the acclaimed grappler from Japan. Though Itami was able to handle himself that night, The Ascension’s interest in ridding NXT of the newcomer turned into an obsession, with Konnor & Viktor not only viciously attacking Itami but also his mentor and friend, Funaki. Enter Finn Bálor. With Itami’s back seemingly against the wall, he reached out to the Irish-born Superstar to help him turn back The Ascension, and on the Nov. 6 edition of NXT, they did just that. Mere moments after Itami introduced his friend, the two international fighters cut Konnor & Viktor down to size in an exhilarating blitz. Anxious to remind everyone — most of all, Itami & Bálor — of their well-deserved bad reputation, The Ascension made a statement weeks later when they trashed two teams, Enzo Amore & Colin Cassady and Scott Dawson & Dash Wilder, in a brutal beatdown and then promised to “rise again.” Then, on the Nov. 27 edition of WWE NXT, The Ascension attacked Bálor during his match against Tyson Kidd, prompting Itami to enter the scene and setting off a wild, pull-apart brawl! 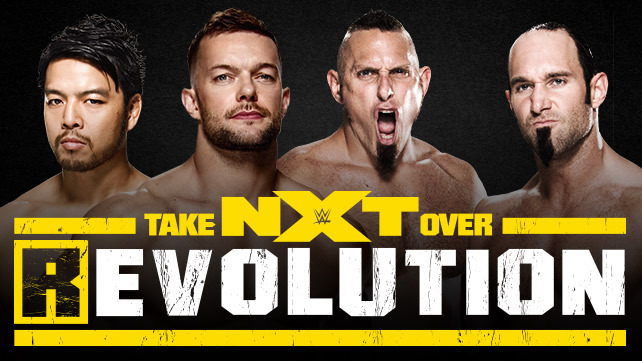 Which team will prevail when NXT TakeOver: R Evolution airs live on WWE Network? Will the dynamic combo of Itami & Bálor prove to be more than Konnor & Viktor can handle, or will they succumb to the Fall of Man? To find out, watch NXT TakeOver: R Evolution on WWE Network Thursday, Dec. 11, at 8 p.m. ET/5 p.m. PT.